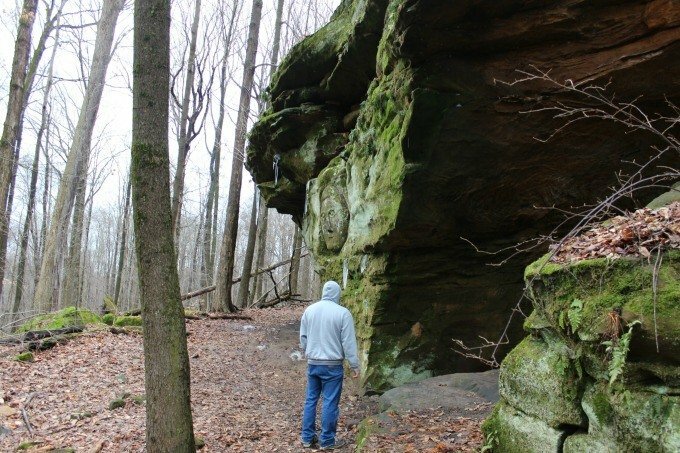 Worden’s Ledges located on the Hinckley Reservation are part of Cleveland Metroparks and are just over an hour drive from my home and yet, until recently, I’d never heard of this hiking trail. 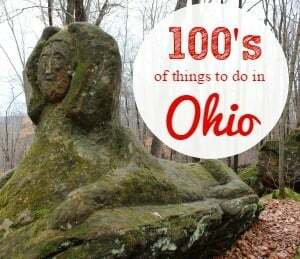 With my love of roadside attractions and everything fun and quirky, I thought this would be the perfect destination for my husband and I to explore. 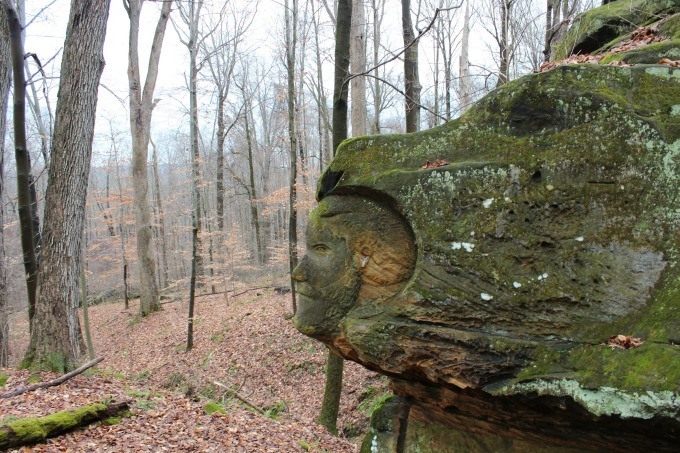 The unique carvings can be found at the Worden Heritage Homestead at 859 Ledge Road outside of Hinckley. 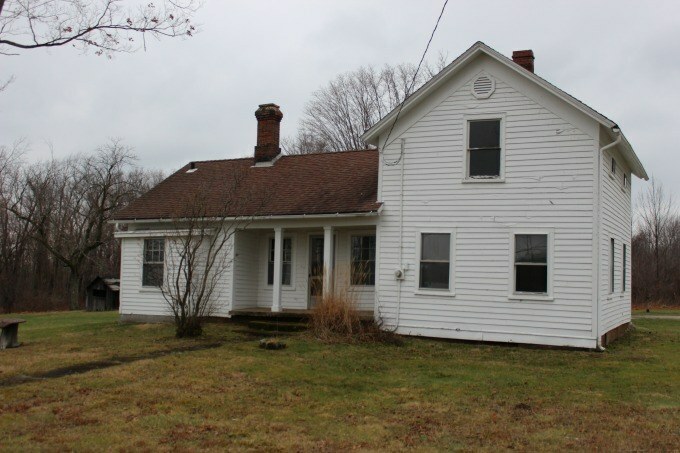 The house was built in 1860 by Hiram Worden and was home to the family for four generations. UPDATE: Unfortunately, the home is no longer standing. 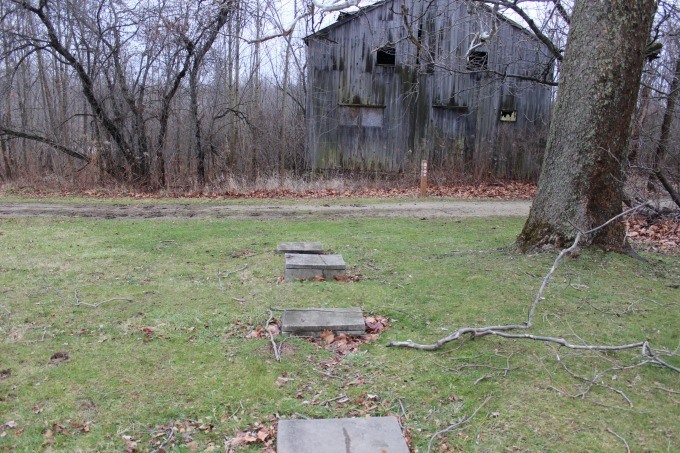 It was razed by Cleveland Metroparks in July of 2017. You can read that story here. The home, no longer open to the public, is not the draw to this property. 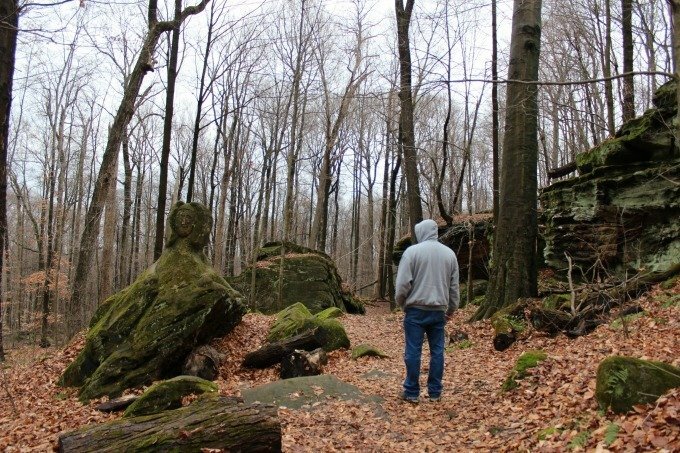 The real treasures are found about a mile behind the house and are accessed by an easy trail that runs to what is known as the ledges. 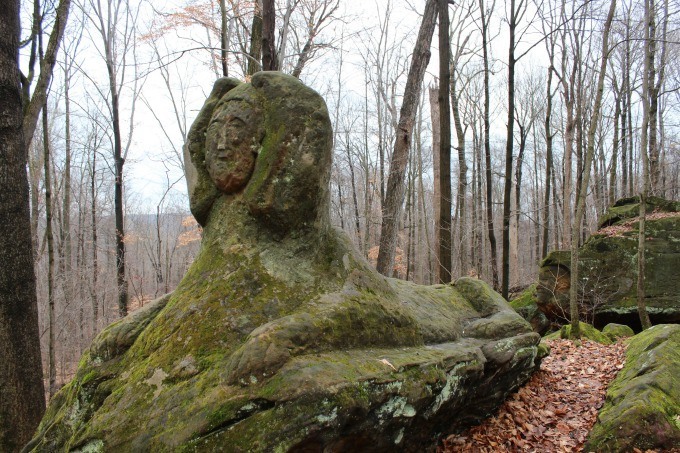 Worden’s Ledges are huge sandstone rock formations that feature the artwork of folk artist Noble Stuart who married into the Noble Family. 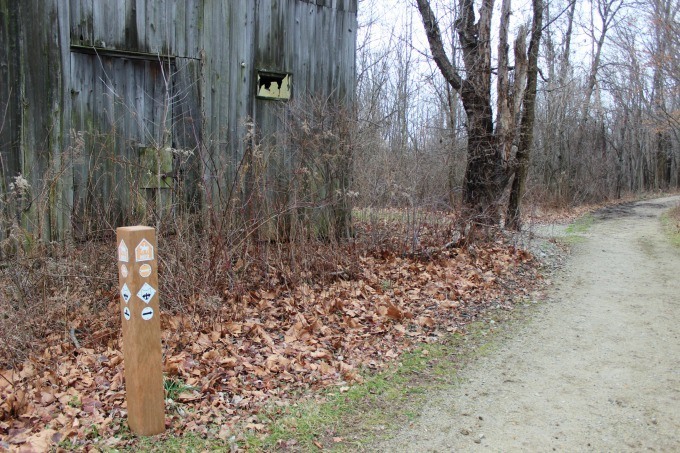 The trailhead is easily located, as it begins near an old barn on the property, and is well marked and easy to follow. The mile-long trail is level with a gradual decline as you near the path that leads to the cliffs. Follow the trail signs to the ledges. You’ll know you’re in the right place when you see a 14-foot long sphinx guarding the path that leads to the additional carvings. 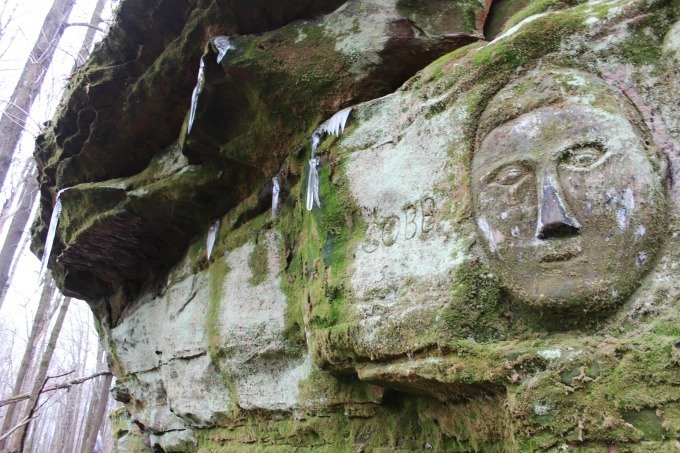 You’ll find carvings of George Washington, the Marquis de Lafayette, a cross and Bible, schooner, and baseball legend Ty Cobb whose face is carved into a cliff. The nine carvings were created sometime in the mid to late 1940’s. 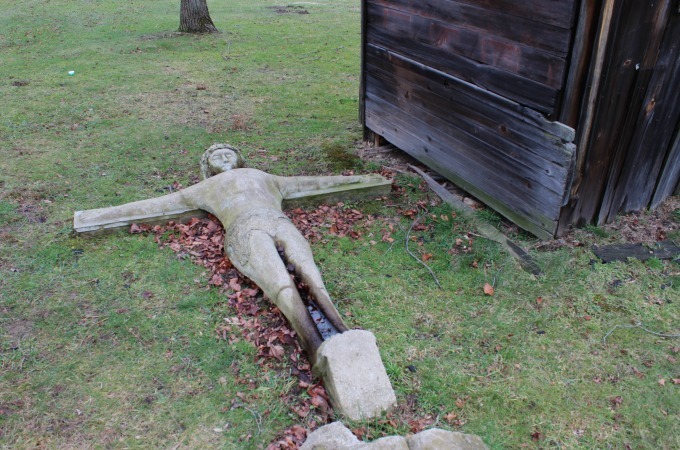 Additional sculptures are said to be found at the farmhouse, but I only spotted the sculpture of Jesus on the cross with what I assume is the Bible at his feet. 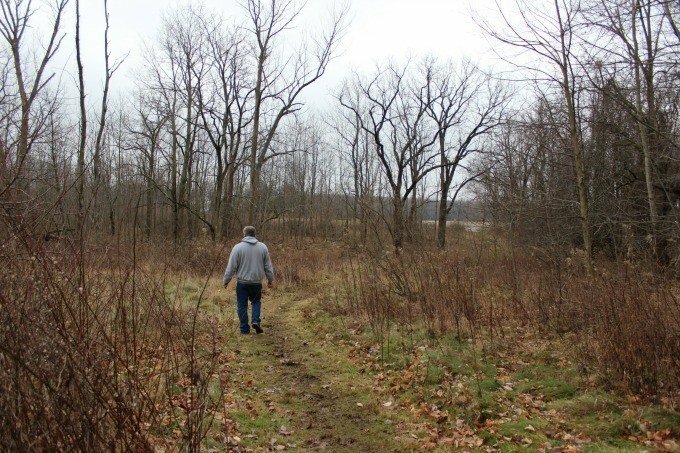 Of all the trails my husband and I have taken over the years, as a lover of all things unique and quirky, this is by far one of my favorites. We hadn’t even left the property before we began to plan a return visit. 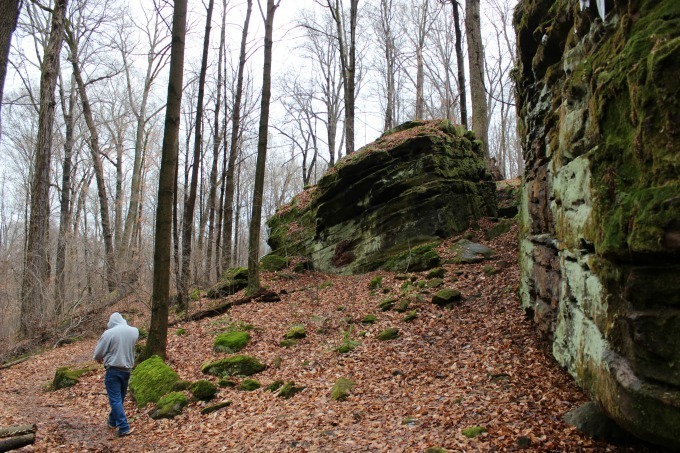 Our kids would love to hike this trail and explore the ledges. Or at least we think they would. The park, and trail is free to visitors. 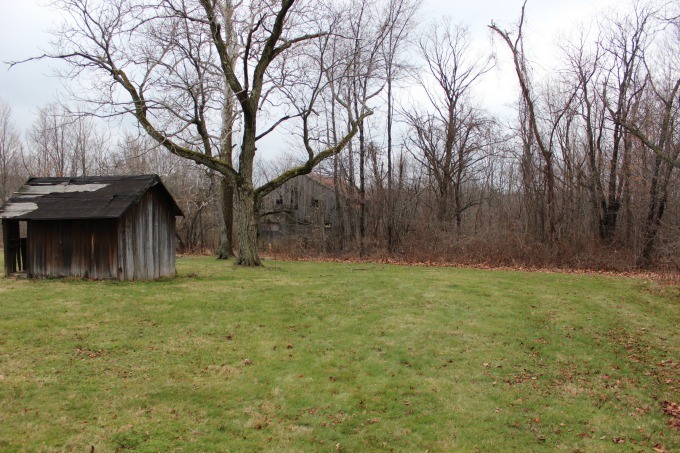 A couple picnic tables are located on the lawn of the Worden Heritage Homestead for those who wish to pack a picnic lunch. 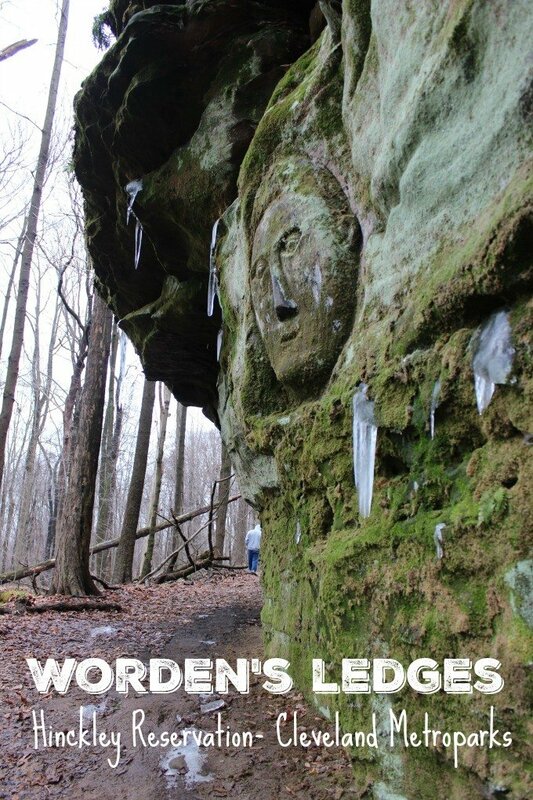 Visit this website if you’d like to learn more about Worden’s Ledges. 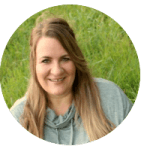 © 2016 – 2019, Tonya Prater. All rights reserved. 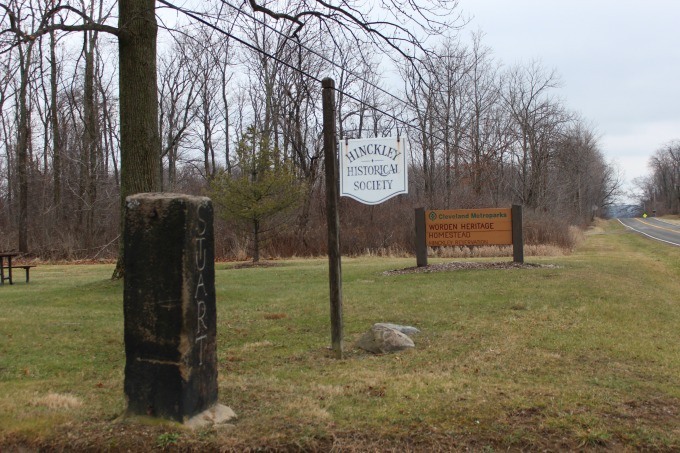 The home was very much a draw to this property, it was a Museum that was a part of Hinckley and was very important to the people of Hinckley and Surrounding Communities it was Package deal that the Historical Society and Metroparks did not care about! It was a very unique Property that a lot of people cared about and were trying to save! This looked like a very nice walk. 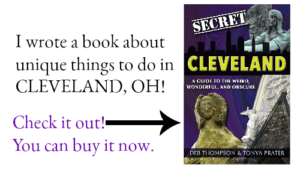 Ned to put it on my list for when I am in Ohio. Very cool! Thanks for sharing, Tonya. I’m scheduling it to share on my 1000thingstodo in Ohio Facebook Page for tomorrow. I’m sure there are followers there who would appreciate it.